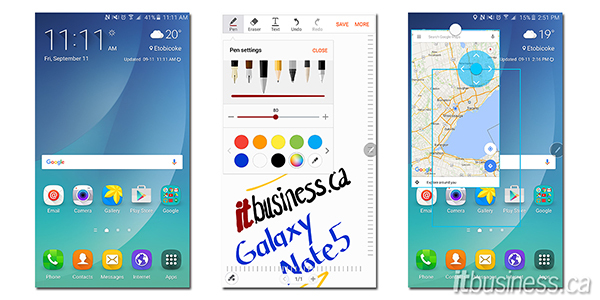 Samsung’s Note smartphones practically invented the phablet category and last year’s model, the Note 4, was a culmination of all its big-screen device innovations and was one of our favourite devices of 2014, being an IT Business Canada Top 10 Smartphone for Business. Although by the time the Note 4 was released phablets were no longer niche products, it was still the largest phone in our 2014 round up. This year that changed. The release of the iPhone 6 Plus and its ensuing popularity sent a clear message that everyone wants big phones, and in 2015 big-screen phones have moved from being a popular niche to the mainstream. 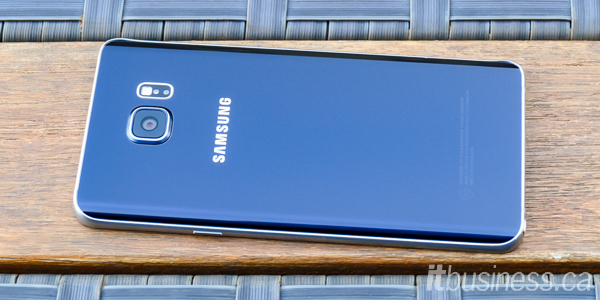 Nearly every 2015 flagship (with a few exceptions) has a larger than 5-inch display. With the Note 5 then, Samsung has gone back to the drawing board to produce a big phone that can appeal to the mainstream. Unfortunately, that means that it has dispensed with a few of the Note 4’s notable features like a large removable battery and expandable storage and adopted the stylish glass and metal design of this year’s Galaxy S6, just in a bigger form factor. We’ve been able to spend some time with the Galaxy Note 5 and read on to see why we think it’s one of the best phones you can currently buy. Availability & Pricing Bell Mobility, Eastlink, MTS, Rogers, SaskTel, Telus, Wind Mobile and Videotron. 32 GB Model starting at $360 on a 2-year term, $850 outright. 64 GB Model starting at $440 on a 2-year term, $900 outright. As mentioned above, the Note 5 has seen some significant changes in 2015 that make it more of a bigger Galaxy S phone, rather than a completely separate class of device as it was in previous years. Despite these changes, one essential feature remains, the signature S Pen stylus that is the reason it’s called a Note, and what sets it apart from all the other large-screen phones. On the Note 5, both the S Pen hardware and the software for it have seen some upgrades. The stylus itself hasn’t changed much, but it now has a clicker on its end that you press to eject it from the phone. Don’t put it in backwards, though, since if you accidently do it’s almost impossible to remove again. On the software side, the Air Command menu for the S Pen’s functions has been improved, and there are some neat new features, such as being able to write on the screen when it is off to instantly start taking a handwritten note. Like the Note 4, the Note 5’s 5.7-inch screen is gorgeous, being just as crisp as its predecessor’s, but its maximum brightness is now even higher, making it easier to use the Note 5 outdoors in bright light. Below the beautiful display is the characteristic Samsung home button that doubles as a fingerprint reader. As with the Galaxy S6, the Note 5’s reader use touch instead of a swipe to scan you finger, and reads it almost instantaneously. It can be used to unlock your phone, used with third-party applications like the LastPass password manager and even for two-factor authentication when using Samsung’s KNOX Enterprise security. At first glance, the Galaxy Note 5 does simply look a lot like a bigger Galaxy S6, but when you turn it over you can see the back of the phone is curved on the sides, which makes it more comfortable to hold. The materials used in the Note 5’s construction are aluminum and glass, which give the phone a premium look and feel. Impressively, despite its screen size, the Note 5 is still very compact for a big phone, with an outstanding screen-to-body ratio. 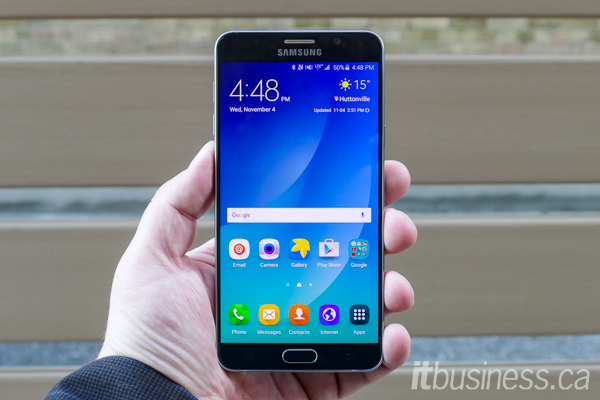 This means that the Note 5 is, in fact, smaller than the Note 4 and a lot easier to use in one hand. The internal hardware specs of the Note 5 are almost identical to the Galaxy S6 (other than the Note’s extra 1 GB of RAM). 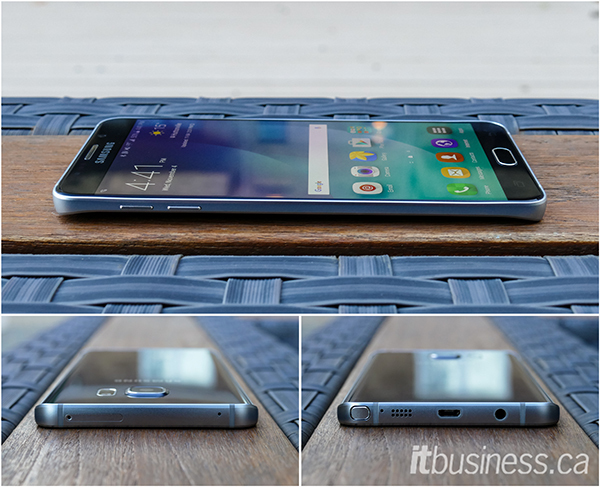 Still, through further optimization if you compare the results of the Galaxy S6 in our review you’ll see that the Note 5 is even faster than this already blazingly fast device. Above you can see how it compares to other leading devices, and apart from the slightly faster graphics performance of the new iPhone and Nexus 6P, the Note 5 outperforms every phone we’ve looked at. Impressively even though the Note 5 has a smaller battery than the Note 4’s 3,220 mAh cell, it actually runs longer than its predecessor. Keep in mind the duration numbers above are results from a test that continuously benchmarks the phone, not real world battery life figures. Our experience in day to day use show that the Note 5 excels in this department, easily lasting a full day and then some. This is comforting to know when many other phones this year seem to have worse battery life than their predecessors. The Note 5’s runs Android 5.1.1 with Samsung’s TouchWiz launcher than has been further refined from the already improved one on the Galaxy S6. Over the years, Touchwiz has been improved and streamlined enough that it is finally as good as stock Android, despite still be visually very different. For enterprise users, the Note 5 fully supports Samsung’s KNOX for security and device management. Although the Note 5 uses the same excellent camera hardware as the Galaxy S6, which already takes stunning pictures, Samsung has further enhanced its software side with better image processing and more advanced manual controls. 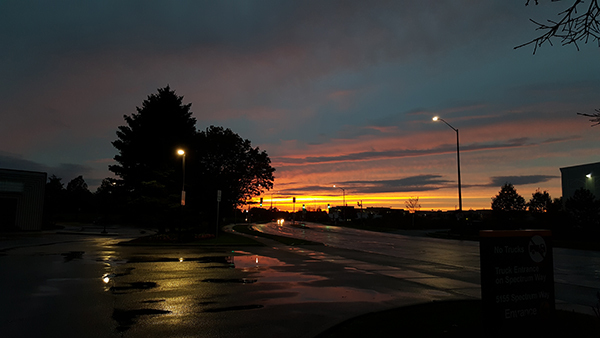 With these improvements, we can safely say that the Note 5 has the best camera of any phone we’ve tested. The Note 5 is certainly the king of large-screen Android phones and for business users looking to satisfy their phablet needs it’s the current phone to beat. It’s the most powerful smartphone we’ve tested and has the best camera currently available. Its only real drawback is its high price, but it’s comparable to other premium devices in its category. The Samsung Galaxy Note 5 is available from Bell, Eastlink, MTS, Rogers, SaskTel, Telus, Wind Mobile, and Videotron and starts at $360 on a 2-year term, $850 outright.